Ulysses has long been one of the best text editors on the Mac and their iPad counterpart is a stunning example of high-quality software on a tablet. I love using both of these apps on a daily basis, and they are where most articles you see written here originate. One glaring omission from the Ulysses suite of apps was an iPhone version. I loved being able to sync my work between my Mac and iPad, which is where I get most of my writing done, but I use my iPhone now and again to write on the go. It pained me to have to use Daedalus Touch, which seems like it should be a good app, but I have never been able to get any value out of. That pain ends today, and the Solemn have updated their iPad Ulysses app to run on the iPhone as well, and I’m happy to say that it’s a brilliant phone app that pairs wonderfully with its older siblings. The thing that stands out the most in Ulysses, and what makes it stand out the most for me, is it’s slick user interface. Most text editors boil down to a list of files in a folder and you can simply tap into one to edit it and scroll up and down the list to navigate. Ulysses has a whole filing system1 that lets you keep your documents organized. As a blogger, my needs aren’t that complicated, I have a couple folders that I like to keep to manage my work. I have one folder for current works in progress, one for notes and ideas, and I have one for my archives. It’s a simple setup, but it’s one that most other writing apps fail to enable. There’s something very satisfying in moving a long article to the archive after putting the finishing touches on it. But it’s not all in the organization that Ulysses triumphs. The interface when you’re writing is truly sublime. Like most other text editors, Ulysses features a control bar right above the on-screen keyboard. At first glance this looks to be less feature-rich than some other apps, but that would be a woeful misconception. This bar looks minimal, but each of those buttons contains up to a dozen tools underneath. For example, tapping the left-center button reveals heading, code, and list tags. The “A” button has all of your text styling options (bold, italics, and links, as well as embeds for videos, images, and footnotes). It does take a second to remember where every option is, but once you do, it’s extremely nice to have everything just 2 taps away. This is a link to [Apple.com](1). Pretty great, right? Ulysses is still using Markdown to render everything, but it’s hiding all the complexity, so you can just write. Even as someone who could write the whole thing in HTML if I wanted, I love this simple interface when writing. I don’t want to think about code, I want to think about the words. Each of these formats has a few settings you can set so that you get exactly what you want. It’s very powerful, and unlike any other text editor I have used. Ulysses looks so good it made me want to take notes and make my website look like this. It’s a beautiful app that just gets everything right. It all starts with the icon, which is a nice combination of black and yellow, a look that is both beautiful and unlike any other app on my phone. Once you go into the app, all the tiny graphics are slick and the typography is super sharp. It’s just using the system font of San Francisco, but there’s something about the weight and size of the text they have chosen that makes it look better here than anywhere else I have seen it. But the app looks best when you’re actually in the muck, writing your masterpiece. I love what they do with highlighting and accenting certain elements in the document. Links have a nice box around them, headings are a cool blue color, and images are denoted by a little box that says “IMG” letting you know there is an image there, but it’s not going to take up any of your precious writing space. If the default looks doesn’t work for you, you can tap the gear icon to edit the font (choose from over 100 options), layout, or change the color theme entirely. I love the standard settings, but you can tweak all you want. If you are using Ulysses for Mac, your custom themes will even sync over to the iOS versions seamlessly. Maybe it’s a little obsessive to want a text editor that looks great, but it makes the writing experience better, and nothing does this better than Ulysses. While Ulysses is mostly perfect, there is one point that drives me absolutely crazy when using the app (and this is a frustration with all versions of the app). I don’t like how I can’t write inline HTML inside the document. HTML tends to trigger some of the Markdown shortcuts and screw up my code. My workaround is to switch over to another text editor (Byword) to do these articles, which is less than ideal. The ideal solution would if there was a way to tell Ulysses to turn off all its smarts for a little bit and trust me that I know what I’m writing. Of course, I know I’m not the average user and enabling such an ability might eat into their whole “Markdown for people who don’t care about Markdown” pitch. But if they ever do add it, I’ll immediately delete all backup text editors on my devices! Ulysses has completed the trifecta of having great apps on the Mac, iPad, and iPhone. It’s amazing how they have been able to shrink the Mac app down to these mobile devices all the while holding onto all functionality and almost getting better as we move to smaller and smaller screens. This is a stellar app that is totally worth the price of admission. I hesitated at first as well, but I’m so happy that I made the plunge. The way they have been able to meld simplicity and power into one app is laudable. The fact that it looks so good is just a cherry on top. 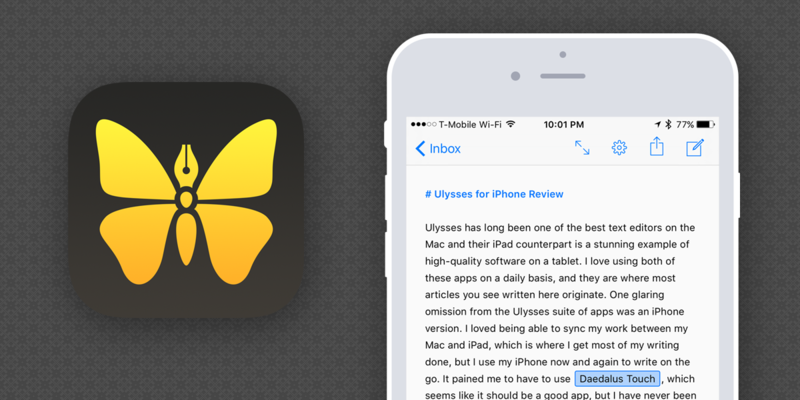 Ulysses is the gold standard in iOS design and gets my highest recommendation. Ulysses Mobile is on sale for $19.99 for launch week and will then be $24.99 afterwards. It’s a universal app, so you just need to pay once to get it for all your iOS devices (even your iPad Pro). Disclosure: I have been using the Ulysses for iPhone beta for months, but I paid for the app on my Mac and iPad previous to having a beta. If this was not a free update included with the iPad app, I would have bought it again.